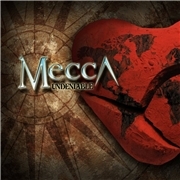 MECCA is that almost mythical proposition of a band that made headlines in 2002 with their debut ”Mecca”. They were compared to the likes of JOURNEY and TOTO. Of cause some might say, main man and vocalist Joe Vana was aided by ex. TOTO members Fergie Frederiksen and David Hungate, plus the song writing and production skills of Jim Peterik (SURVIVOR). Since then various efforts has been made to create a follow-up involving Tommy Denander and guitarist Christian Wolff. The core band that emerged was Joe on vocals, his son Joey on guitars as well as Mark Alano, bass player Wally Hustin, drummer Rick Witek, synthesizer player Paul Pisciotto, and keyboard man Brian Moritz. An album that spent seven years in the making should either be a masterpiece…or a disaster. The gentle and superbly arranged opener “Perfect World” hits neither territory. It is a very ok track, but clearly surpassed by the craftsmanship melodic rock of the JOHN WAITE reminiscent “Did It All for Love” or the truly outstanding “W2W”, the rocker of the album, or the TOTO moment of the title track. The melodies are often so classy they feel like being back in the 80´s. But when I feel the need to adjust my pacemaker listening to “Deceptive Cadence” not to fall into unconsciousness I remember the disadvantages of slick song writing. But the band´s low moments are high in comparison; I just get pickier when I listen to bands like this. MECCA sure is worthwhile, even sweetly enjoyable. And to make up for a long lost time, Frontiers states that MECCA III is underway!